in 2006 – the world’s tallest known living tree. 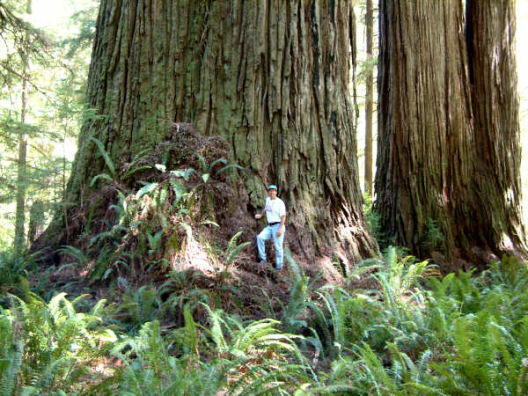 The world’s tallest tree, the California or coast redwood (Sequoia sempervirens). The single tallest specimen identified to date (and there could well be others even taller) has been named Hyperion, after a towering figure in Greek mythology (the Titan god of heavenly light). Hyperion claims the title as the world’s tallest known living tree. It is approximately 380 feet tall, 80 feet longer than a football field! Hyperion grows in a secluded area of Redwood National Park in Northern California, north of Eureka and Arcata, in the Northern Coast Ranges. “Screaming Titans” redwood in Jedediah Smith Redwoods State Park. 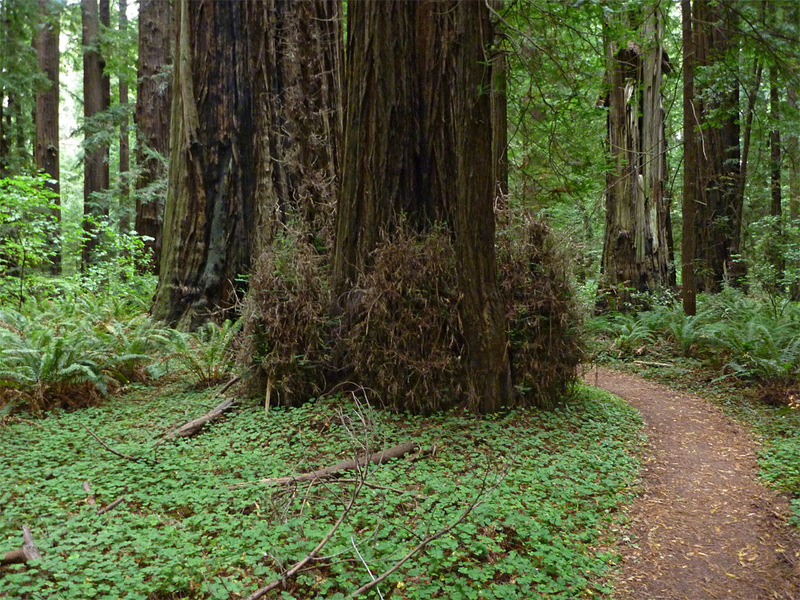 Hyperion’s exact location has been kept a secret to protect this venerable 600-year-old giant (a mere juvenile among redwoods) from possible damage or vandalism by humans. “Stratosphere Giant,” until 2006, believed to be the tallest known living redwood and world’s tallest living tree. It looks like one of the mythical colossuses from the ancient enchanted forest of Lothlorien in J.R.R. Tolkien’s epic The Lord of the Rings. The world’s biggest tree, the giant sequoia (Sequoiadendron giganteum). The sequoia is a relative of the redwood; it grows in scattered groves found only on the upper, western slopes of California’s Sierra Nevada mountain range. The sequoia boasts a greater volume of wood than any other contemporary, standing tree in the world. 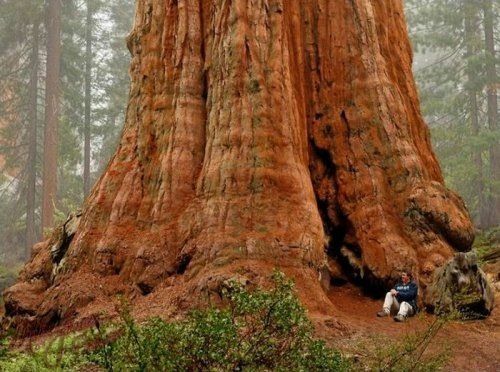 The single largest specimen has been named the General Sherman Tree, which resides in a grove in Sequoia National Park. The General Sherman Tree stands 275 feet tall and has a diameter of 36.5 feet at its base (circumference of 103 feet). The volume of the trunk is estimated at 52,500 cubic feet. It is believed to be about 2,000 years old. Unlike Hyperion, the location of the General Sherman Tree is well-known, and it receives hundreds of thousands of visitors every year, although none are allowed to approach the base of the massive trunk, to avoid soil compaction and possible root damage or the temptation to vandalize it (that some sociopathic cretins might feel). I have visited and gaped awestruck at this tremendous hulk of a tree several times; it is a veritable goliath among mere giants. note people in lower left. Bristlecone pine growing in California’s White Mountains. The world’s oldest tree, the bristlecone pine (Pinus longaeva), sometimes called the Great Basin bristlecone pine to distinguish it from other related species, grows in the White Mountains of eastern California (east of the Sierra Nevada), as well as in Utah and Nevada. The oldest specimen of bristlecone pine found to date was 5,062 years old and still living as of 2012. It is over five millennia or 50 centuries in age! It was already hundreds of years old when the Great Pyramids of Giza were erected in Egypt, and had endured more than 3,000 winters by the time Jesus Christ was born! That puts human scale into a certain perspective. The “ancient past” that we humans call Antiquity – say, the eras of the Ancient Greeks and the Roman and Persian Empires – were but a fleeting phase in the youth or early adulthood of these hardy, timeless patriarchs and matriarchs. California and Californians should be very proud and protective of these natural wonders, part of our state’s fabulous natural heritage. And it is this natural heritage writ large, symbolized by these trees, which is at risk from overpopulation in California, and the over-immigration driving it. I was reminded of these magnificent trees recently when I began reading the book by naturalist Donald Culross Peattie (1898-1964), A Natural History of North American Trees. A beautiful paperback edition of this classic, originally published in 1948, was released in 2013 by Trinity University Press (San Antonio, Texas). Well-known Los Angeles artist Paul Landacre (1893-1963) graces the book with simple black and white illustrations of each species described; these renderings manage to capture some of the essence of each tree. I strongly recommend this book for all tree lovers. Better yet, get out into California’s trees and embrace them. You needn’t, as John Muir once did, climb high up a Douglas-fir in a storm to feel its life-force and swaying. A mere hug of a solid, substantial tree trunk would be enough, like author and fellow tree lover J.R.R. Tolkien used to do. Tolkien’s beloved classics The Hobbit and The Lord of the Rings read almost like natural history guides to the woodlands and forests of Middle Earth, with the trees of the Old Forest, Mirkwood, Fangorn and Lothlorien – and the tree shepherds known as the Ents – all figuring prominently in the storytelling. Walking in wonder among California’s northern redwood forests years ago, gliding along enchanted paths through the carpet-like redwood sorrel (Oxalis oregana) and even sleeping two nights inside a hollow redwood, more than once did I feel like a hobbit in a fairy tale. This is our immense natural legacy. Be sure to get out and enjoy it, while life lasts.